U.S. stocks ended slightly lower on Friday, paring gains for the week as disappointing economic growth data overshadowed strong earnings from several leading technology companies. The Commerce Department reported that the economy expanded by 0.7% in the first quarter, the slowest growth pace in three years, missing economists’ 1% consensus estimate and down from 2.1% GDP growth the quarter prior. Weak consumer spending was the primary drag on growth, up the least since 2009. In positives, residential spending jumped 13.7% and overall business investment rose 9.4%, the most since 2013. With nearly 300 in the S&P 500 reporting first quarter earnings, approximately 85% have topped analysts’ projections. Moreover, 66% of S&P 500 companies have exceeded their revenue forecasts, their highest level since the second quarter of 2011. For the week, the S&P 500 gained +1.53% and the Dow Industrials advanced +1.91%. Led by strong earnings from technology companies, the MSCI EAFE (developed international) jumped +3.09%. Stocks have rallied since the November election amid a “reflation trade,” which is broadly defined as an expectation of both higher inflation and stronger real economic growth. However, investors have recently started to doubt these themes as data on both fronts showing some weakness. First quarter GDP numbers this coming Friday could show growth below 1%, largely reflecting weaker consumer spending. In addition, following an oil-driven surge in consumer price inflation to 2.8% year-over-year in February, the March cost-of-living inflation retreated back to 2.4%, well below expectations. Lower actual inflation numbers have also crept into market expectations, with the difference between 10-year nominal Treasury yields and 10-year Treasury Inflation Protected securities (TIPs) falling from a post-election high of 2.07% to just 1.86%, as is shown in Chart 1. While a stall-out in oil prices and cautious consumers are responsible for some current weakness in economic data, the reflation theme is also being challenged by political disagreement in Washington, creating uncertainty around the timeliness and extent of both tax cuts and government spending increases. 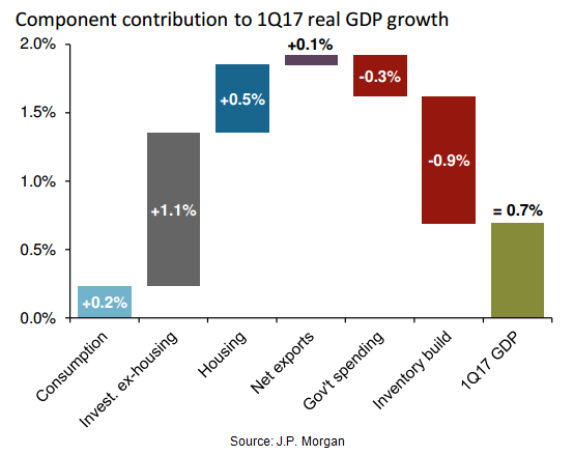 According to J.P. Morgan, even without fiscal stimulus, both growth and inflation could rebound in the months ahead. However, for now, the U.S. economic environment seems neither as positive for equities nor as negative for fixed income as has generally been assumed since election day.